Fender Champion Model 600 Model Tube Amplifier (1951), made in Fullerton, California, serial # 2184, Cream and Brown fabric covering finish. 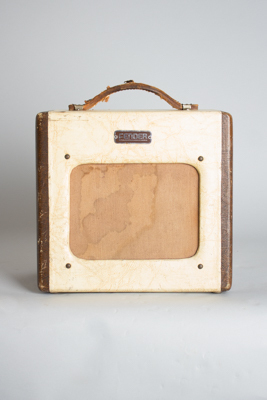 The Fender "Champion 600" was the company's early student amp aimed at teaching studios, and their success helped keep Leo's dream afloat in the early days. These early '50s models are not as loud or crunchy as later Champs; they start out sweet and remain fairly civilized at low volumes, but still get the grit when cranked! Height is 11 in. (27.9 cm. ), 12 in. (30.5 cm.) width, and 6 3/4 in. (17.1 cm.) deep. This early Champ has some wear as well as typical maintenance -- a more recent speaker and grounded 3-prong power cord have been added. The insides remain otherwise nicely original, with period tubes and minimal alteration. There is moderate wear overall; the grill cloth has some staining, the handle is fraying on top, there is one "classic" ciggy burn on the top front edge of the cabinet, and for some reason the back panel has a lot of wear to the enamel, looking rather more beat up than the rest of the amp. Still a very good-looking and sounding amp and not bad for almost 70 years! Overall Very Good + Condition.